This model is discontinued. 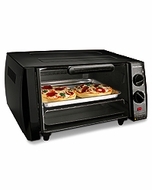 As an alternative, we recommend the Proctor-Silex 31115 Extra-Large Toaster Oven / Broiler. Whether it's breakfast, lunch, or an afternoon snack, this toaster oven not only toasts, but it also bakes and broils, making it a convenient multi-function family oven.